Arriving back from Israel/Palestine, I went to the Post Office to collect my accumulated uncollected parcels and the highlight was a second hand copy of the Hayward Gallery's 1985 catalogue of their Edward Burra show. It is a balm for the soul. He is a strikingly accomplished painter with a unique, instantly recognizable vision. 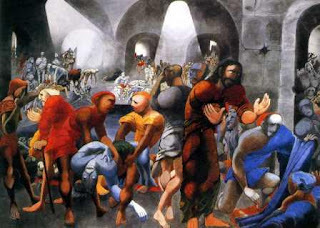 First that each and every figure in his work is uniquely themselves and a character: personality exudes. He allows the people he sees their voice. He is noticeably a painter of bars, cafes, night life beyond the 'respectable' and paints with compassion, engagement and liking. He paints 'blacks' at a time (has it changed) when they were the discriminated other in the very places of their marginalization without any trace of anything other than an equality of regard. The Cremisan Monastery that self-describes itself as juxtaposed between 'Israeli tower blocks and Palestinian luxury villas' (http://www.cremisan.org/index.html) in fact stands on land donated by Palestinians in the nineteenth century from a village slowly being encircled by Israel's new security fence. 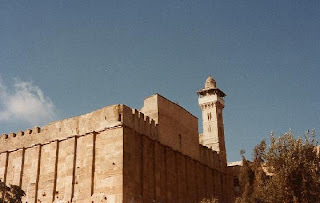 There is a both a synagogue and a mosque on the same site, honouring the Patriarchs: Abraham, Issac and Jacob. It is the place traditionally held to be their tombs. The roots of Judaism are here. The foundations of Islam are here. They are in the centre of the city of Hebron, where David founded his renewed kingdom of Judea. It is a place charged with conflicting religious meanings and competing historical narratives. It is, thus, a place of violence. Riding in the Chariot: Not for everyone! When Patrick White's 'Riders in the Chariot' was first published, he records in his autobiography being telephoned one day 'out of the blue' by a person carrying a thick accent from somewhere in Central Europe asking him whether he wanted to 'go further'. He understood this to mean an invitation to more deeply explore the Kabbalah of which Himmelfarb (one of the book's central characters) becomes a student and whose imagery underpins the frame of the book itself. White declined and it was only when he was putting the receiver down that he realized who the voice belonged to; namely, the relative of a friend, whom he had seen occasionally at social gatherings, out of place, carrying more than a flavour of the 'shtetl' and whose 'presence' had intrigued him. He was immediately filled with regret but equally felt that the moment of invitation had passed. This is quoted by Morris Berman in an essay entitled 'The Hula Hoop Theory of History' that reflects on our human capacity for conversion to the next new idea, convinced that we now have not an answer to a particular contextualized question but 'The Answer' that supersedes all previous answers (until, of course, the next Answer comes along)! 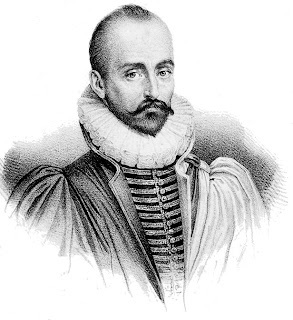 Montaigne is suggesting, I think, that rather than be humble in the face of reality, contemplating it in its complexity, enterprising after ways of seeing it that never foreclose, we are more comfortable with total solutions - better to create a god in our own image (or ideology) than contemplate the mysteries and actualities of a worm: that which is gifted, present. My last visit to Israel was under the auspice of the World Bank to look at provision of micro-finance in the Palestinian territories. I duly wrote my report that was duly ignored. I did get a stream of queries for six months afterwards. None of which required me to provide an answer beyond a page reference to my prior report. I felt a career as a consultant to the World Bank was not one that was fruitfully pursued! I vividly remember being so arduously pursued by an Armenian shopkeeper (of jewelery) that I had to take refuge in a bookshop (in the Old City of Jerusalem)! Equally I remember a visit to the Church of the Holy Sepulchre where I noticed one of the ushers doing something unusual with his feet. He was dribbling an empty plastic Coke bottle to the head of a set of stairs, leading to a portion of the Church administered by a rival denomination, down which he surreptitiously kicked the said bottle! A vision of the religion of agape in inaction! Sitting on the train, the man beside me answers his mobile and explains that he is on the train and apologizes that he may lose his signal. He continues to explain the particular business problem in detail until mercifully his signal is severed. There is no consciousness of an apology to the person who he is sitting next to, for carrying out a 'noisy conversation' and disturbing his reading. It is an apparently trivial act of 'social violence'. An evening reading the poems of Oscar Vladslas de Lubicz Milosz (one of the more glorious names in the annals of literature). He was a distant cousin of the Nobel laureate, Czeslaw Milosz, whom he treated as a son. 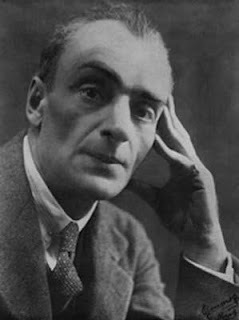 Born of a Russian father and a Polish Jewish mother at his family's estates in Belarus, he was educated by solitude and in France and chose to write in French. France became his home after the Russian revolution though he originally chose the citizenship of Lithuania and represented them as a diplomat at Versailles and subsequently. His closest poetic antecedent is a writer he probably did not know: William Blake. He is a poet of visionary intensity who seeks to offer a different world perspective from that of scientific materialism. He evokes a world of symbolic meaning where everything is translucent to a sacred ordering. For a dedicated agnostic, Vaughan Williams wrote some of the most strikingly beautiful religious music of the twentieth century both framed within the liturgy - his Mass in G - and within 'secular' settings as with the piece I listened to as I drove to visit my mother: Job: A Masque for Dancing. When I was nine or so, my mother found me, to her great surprise, propped up in bed reading the Bible! A surprise doubled by finding that I was reading the Book of Job with fascinated incomprehension! I was engaging in sibling rivalry as my older brother had embarked on reading the Bible from Genesis to Revelation (a task I believe he completed).